Simple, healthy and easy, these grilled kielbasa & veggie kabobs will be ready in under 30 minutes! If using wooden skewers, soak them in water for 10 – 30 minutes. In a small bowl, combine the olive oil, dijon and pepper, mix well. Set aside. Skewer the sausage and veggies however you like. I started with the kielbasa, red pepper, onion, green pepper, zucchini, and repeat until skewer is full. 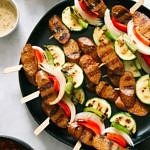 Brush each kabob with the dijon dressing. Grill skewers for 10 – 12 minutes, turning once or twice, or until vegetables are tender. Brush will any remaining oil mixture as needed. Serve with sides of choice. It’s great with grilled corn and baked beans! Makes 12 small kabobs or 8 regular sized. Add more dijon mustard if you like, 1 – 2 teaspoons more is great. This peppery mustard mixture is great brushed on corn before grilling too!